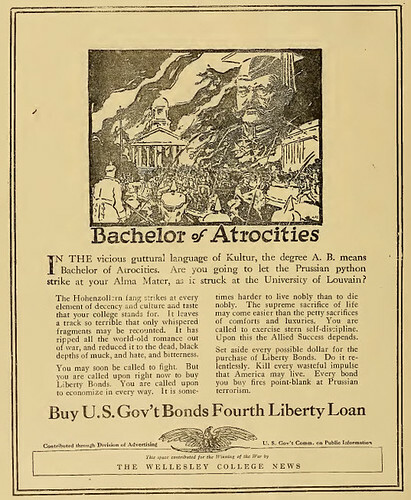 This ad for buying liberty bonds is rather striking in its message of fear. "Are you going to let the Prussian python strike at your Alma Matter as it struck the University of Louvain?" It asks as it proclaims that a B.A. is a "Bachelor of Atrocities." Many other ads for Liberty Bonds typically invoke patriotism, doing one's part, and lending a helping hand, but this message seems so strongly aggressive and hateful that it makes me wonder how successful it was or how others perceived it in relation to the more benign messages.